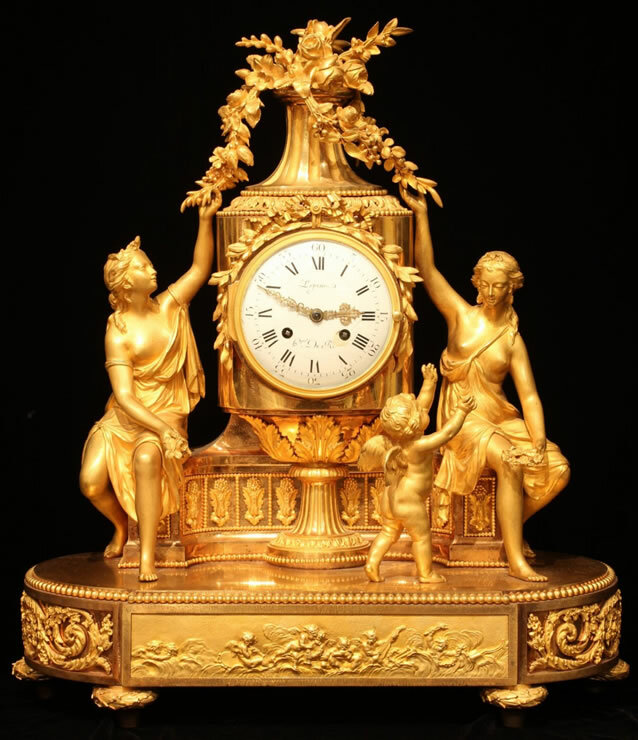 Louis XVI ormoulu mantel clock with movement by Lépine. It depicts two scantily clad women seated on either side of a large flower-filled vase on a pedestal. Both reach up to touch the flowers; one holds a bouquet and looks up at the vase. The other holds a floral crown and smiles down at Cupid as he approaches her, gesturing for it. The oval base has bands of rinceaux on the sides and reliefs of putti musicians on the front and, unusually, on the gilded back. The brilliantly chased bronze doré clock has superb original gilding with matte and burnished areas of great contrast. Another example, but with a marble vase, is preserved at Fontainebleau.